Editor’s Note: Each month a MHS personality goes one-on-one with one of the biggest names in Colorado sports. 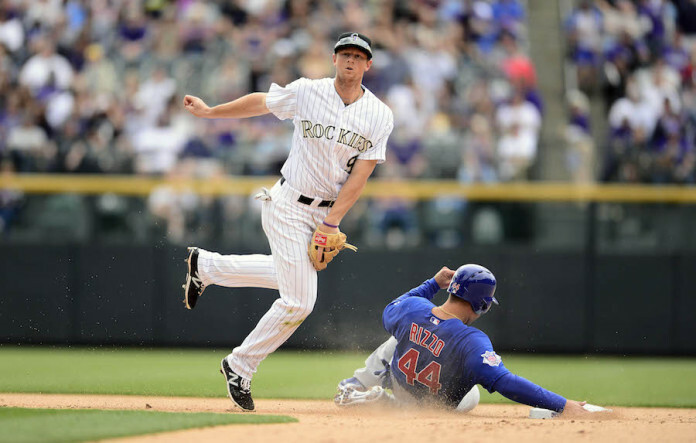 This month, Les Shapiro, co-host of Afternoon Drive, sat down with Rockies All-Star second baseman DJ LeMahieu. Les Shapiro: Everybody knows you as “DJ,” but does anybody know what “DJ” stands for? Does anybody call you by your actual name, David John? DJ LeMahieu: (Laughing) My mom knows me as David John. Yeah, yeah, that’s how it was growing up, for sure. When you played college ball at LSU, you were like the LeBron James of the baseball team. You really filled up the box score – hits, batting average, stolen bases, runs scored, etc. Your bat wasn’t quiet, but you sure are. You’re known as a shy guy. Were you as shy at LSU as you seem to be here? Yeah, it’s always been my nature. I feel like I’m quiet, but I wouldn’t say I’m shy. I’m not afraid to say something if it needs to be said. I’m not shy to meet people. I’m not shy socially. But when I get to the field, I’m pretty focused. Around my closest friends, I’m a little more extroverted. How about in the clubhouse, are you a prankster at all, do you do any trash-talking? (Laughing) Yeah, I’m a trash-talker. [New first baseman] Mark Reynolds told me, the only time I ever talk is to trash-talk. (Laughing) I guess I’ll take that. You made the All-Star team last year. You actually started at second base in the game. Yet, you’re kind of the “unknown All-Star.” I’ll bet, if you went around Denver and said, “name the Rockies who made the All-Star team last year,” they’d probably say “Nolan Arenado and Carlos Gonzalez.” Does that bother you at all? No, that doesn’t bother me. It’s not what I play for. I don’t play for the recognition or the fame. I’m good with that. It’s fine. I come to the field and do my job every day and whether I’m known or not is not huge for me. What’s your most enduring memory from All-Star weekend? Oh, man. Had a couple of close buddies from high school there. The actual moment that I thought was the coolest was the home run derby. Just to sit on the side and watch Todd Frazier do what he did was probably the coolest part for me. Does that experience motivate you to get back to the All-Star game? I don’t think of it as “I want to make another All-Star team.” I think of it more as, I set the bar higher for myself last year. That’s not a goal. I think it happens with doing things the right way. My focus going into last year was to just be a tougher out and to be as good as I can defensively. And it turned into being an All-Star. And that’s pretty much the same approach I’m going to have this year. You’re a 6-foot-4 second baseman. That’s unusual. When we think of second basemen, we still envision more of a diminutive guy like Jose Altuve. Do you think being that tall ever worked against you and your progress through the minors and into the bigs? Yeah, I think it always hurt me a little bit. I don’t think people ever knew what to think of me – in college or the minors. Should I play second or short or maybe even third. But for me, being tall helps defensively. I have pretty long arms. And somehow, despite my size, I stay pretty low to the ground. So, I think of my height as an advantage. 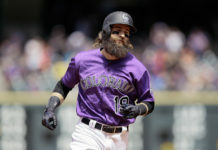 If the Rockies had trouble at shortstop, would be able to fill in? (Laughing) I would like to think I can, but I think we have plenty of shortstops who can handle the job. The Rockies are raising the fences at Coors Field. It’s going to be harder for you to get into double digits for home runs now. (Laughing) Yeah, it was already hard. It’s gonna be a change. We’ll see how it plays out. I don’t know how it’s gonna play out. Are the pitchers in the clubhouse talking at all about how it might change their pitching philosophy? You know, I haven’t heard anything. I think the fence being raised is a way to even out the hitting and pitching at Coors Field. It’s gonna be an advantage for the pitchers. I think it’s gonna save some runs, for sure. 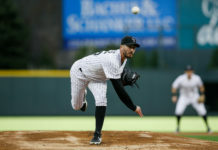 Is there anything else that can be done at Coors to balance offense and defense even more – to bring down run totals even more? I’ve always thought the grounds crew should let the infield grass grow longer to slow down ground balls and cut down on base hits through the infield. You know, the infield grass is some of the longest in the league. Letting the outfield grass grow longer might help [to cut down on doubles and triples]. 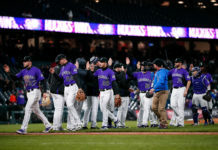 If you could ask the execs and the grounds crew to do one thing to bring more balance to Coors Field, what would that one thing be? I would say, move the fences in and lower the fences! Really? Just the opposite of what they’re doing? I think moving the fences in would eliminate all those bloopers that fall in. The outfield is so big; the outfielders have to play back. This would allow them to play in more. But there are already so many cheap home runs. Won’t there be more with your plan? Yeah, but I think there’ll be fewer hits. So, there’ll be fewer two- and three-run homers and more solo shots. Different subject… When Todd Helton was here, he was mentored by some of the Blake St. Bombers. Then, Helton mentored Troy Tulowitzki. Then, Tulowitzki mentored Nolan Arenado. Who’s been your mentor here? Yeah, absolutely. Tulo was always huge for me. The way he worked, I learned a lot about how to be a professional. Tulo thinks differently from your average baseball player. He believes he’s the best player in the league. And he is one of the best. So, his mindset is different from your average player who’s trying to make it, like me. He taught me how to train to be a superstar. There have been a lot of guys I’ve come into contact with in the organization who’ve helped me, but as player, Tulo’s probably helped me most. After Tulo was traded, was it odd playing without him beside you last summer? I mean, he was your shortstop your whole four-year career here. Yeah, it was, it was. I’ve played without him when he was on the disabled list, but it was completely different without him last year. It was a big change. Let’s talk about this year’s squad. This club, this year, seems a little different to me. The lineup is not loaded with big boppers. Seems you’re more athletic and you have better speed than teams in the past, but we’ll see fewer home runs. It seems more of a grind it out type offense. How do you see it? Will it be a different style of offense than you and the fans are used to? I think we’re more athletic, I think we’ll get better base running. Defensively, I think we’re going to be very good. And you’re right. I don’t think we have the “pop” we’ve had the last couple of years. But at the same time, I think we have a lot of guys who will put out good at-bats. If you look at the Giants or you look at the Royals, they have maybe one or two guys who can do a lot of damage and the rest of the lineup is full of tough outs. I see our lineup being more like the Giants and Royals this year. Last thing…do you set goals for yourself going into a new season? And do you have any you can share with me? No, I don’t. Like last year, I’ll just try to be a tough out and try to be as good as I can defensively. I’ll also try to be a really good teammate. I think if I can focus on those things, everything else will fall into place.